Have you ever noticed how so many lottery players posted wins just when they really need it? Such is the case with Ana Rodriguez, who had been working at the Quincy House dining hall of the Harvard University for the last 30 years. Rodriguez had been struggling to pay her debts and had her house foreclosed just 5 years ago. 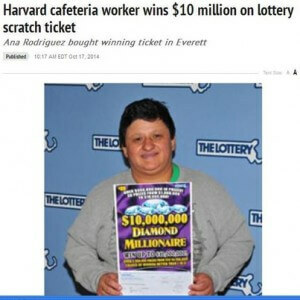 But when she bought a Massachusetts State Lottery’s “$10,000,000 Diamond Millionaire” instant game ticket, her life changed abruptly. She won the top prize of $10 million, instantly wiping out her debts and assuring her financial security with the win. She has since opted to take a one-time payment option of $6.5 million less taxes. Rodriguez plans to continue working for the next couple of years to get her hard-earned benefits. She can now buy a new house, and also plans to take a vacation and help her family financially.